Refills Rubbermaid Pulse™ (sold separately) up to 12 times. Designed for secure transportation and efficient, on-the-go refill. Note: A minimum quantity of 32 must be ordered, and in units of 1 thereafter. 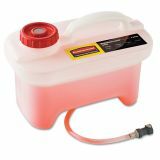 Rubbermaid Commercial HYGEN HYGEN Pulse Caddy With Clean Connect, 2 gal, 8 3/4w x 10 3/4h x 14 1/8l - High-capacity Pulse Caddy is designed for use with the Rubbermaid Pulse Mopping Kit. Caddy lets you clean up to 10,000 square feet to reduce frequent trips to the supply closet. Securely transport in Rubbermaid Cleaning Carts for efficient on-the-go refilling (sold separately).